Coke Studio Season 1 was awarded the silver plaque under the Youth Brand category of the Asia-Pacific Tambuli Awards 2018. 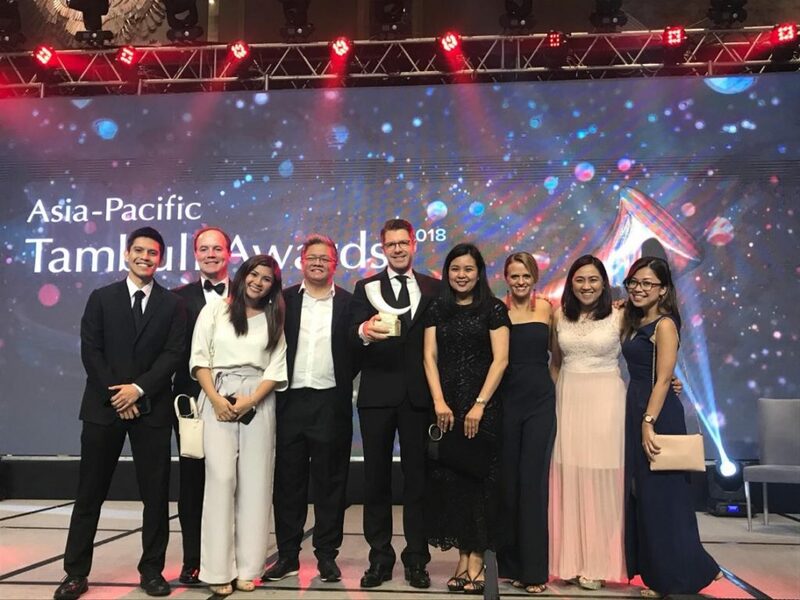 The Coca-Cola Philippines team that received the award was led by Winn Everhart, Coca-Cola Philippines President and General Manager (second from left), and (from left to right) Senior IMC Manager Jason Gervasio, McCann Worldgroup Account Director Teneil Ibanez, McCann Worldgroup Executive Creative Director Joe Dy, Coca-Cola Philippines Marketing Director Stephan Czypionka, IMC Director Jenny Cinco, Marketing Manager for Sparkling Nina Mahnik Marketing Manager for Stills Teejae Sonza, and IMC Manager Tanya Cinco. The first season of Coke Studio was recognized for its outstanding contribution in the development of Original Pilipino Music at the recently concluded Asia Pacific Tambuli Awards. The Tambuli Awards is one of the longest-running award giving bodies that recognizes marketing campaign and programs that adhere to the promotion of human good. For changing the OPM landscape, Coke Studio Season 1, a music platform of Coca-Cola Philippines, was given the silver award under the youth brand category. “Bringing Coke Studio to the Philippines was a great experience for all of us – seeing how music is a huge part of the lives of Filipinos. This award is for everyone who was part of this milestone in the history of Coca-Cola and in the local music industry. It keeps us excited as we prepare for the second season of Coke Studio,” said Stephan Czypionka, Marketing Director of Coca-Cola Philippines. Coke Studio aimed to strengthen the connection of Filipino teens with the brand by underscoring the language of music as a bridge. In the process, Coke Studio became a platform to showcase OPM and increase the interest of teens with local artists and their music. The program provided the local music scene’s newcomers with the opportunity to collaborate with the more established names. The collaborations resulted in the production of exciting new music. The music platform engaged upcoming artists with some of the established names in the industry to create new music. Musicians like Abra, Gracenote, Ransom Collective, Sandwich, Franco, Gab and John f Urbandub, Moonstar88, Reese Lansangan, Ebe Dancel, Autotelic, Noel Cabangon, Curtis Smith, Jensen and the Flips, and BP Valenzuela were part of the first season. The language of music as a unifying force is at the core of the Coke Studio campaign, underscoring the role of music in the lives of Filipino teens, especially in self-expression and as a way to connect with their peers. Like music, Coke is also one of the brands that brings people together. Coke Studio in the Philippines was initiated by Stephan Czypionka, Jenny Cinco, Nina Mahnik, Jesus Ferreira, Jason Gervasio, Macy Magpayo, Jenna Macalagay, Kris Perez, Jonah de Lumen, JB Cajita, Kristine Macaraniag, and Krisha Iliscupidez, all from Coca-Cola Philippines, together with their partner agencies – McCann World Group as the creative agency, Ogilvy One as the digital agency, Ant Savvy as the events agency, Unitel as the production house, KPPR and Stratworks as the public relations agencies, and Starcom as the media agency. Coke Studio Season 2 will air later this year, creating music with more local artists and more Filipinos. The Coca-Cola Company (NYSE: KO) is a total beverage company, offering over 500 brands in more than 200 countries. In addition to the company’s Coca-Cola brands, our portfolio includes some of the world’s most valuable beverage brands, such as AdeS soy-based beverages, Ayataka green tea, Dasani waters, Del Valle juices and nectars, Fanta, Georgia coffee, Gold Peak teas and coffees, Honest Tea, innocent smoothies and juices, Minute Maid juices, Powerade sports drinks, Simply juices, smartwater, Sprite, vitaminwater and ZICO coconut water. We’re constantly transforming our portfolio, from reducing sugar in our drinks to bringing innovative new products to market. We’re also working to reduce our environmental impact by replenishing water and promoting recycling. With our bottling partners, we employ more than 700,000 people, bringing economic opportunity to local communities worldwide. Learn more at Coca-Cola Journey at www.coca-colacompany.com and follow us on Twitter, Instagram, Facebook and LinkedIn. Who is going to do the dishes?